Home » Our Team » What is CESAR? The objective of the CESAR initiative is to provide students from European secondary schools and universities with hands-on experience in Astronomy research in general and in Radio Astronomy and Optical Astronomy in particular. CESAR´s educational projects should not only be of didactic value but should also produce real scientific results within the framework of its limited resources. 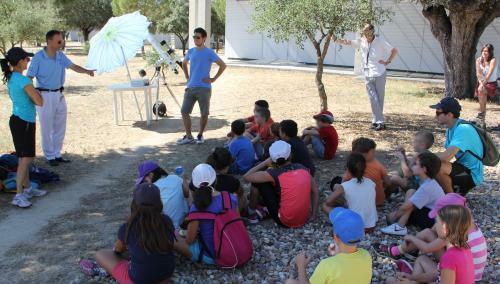 In addition, as a secondary objective, CESAR shall contribute with outreach activities to promote Space Science and to stimulate European student´s interest in Science and Technology in general and Astronomy in particular. The core of CESAR are its observatories consisting of four solar telescopes (visible light and H_alpha), two night telescopes, and one radio telescope. See observatories. Since August 2016, the CESAR ESAC Solar Observatory (CESO) installed at ESA's European Space Astronomy Centre (ESAC) operates daily, weather permitting, and provides images of the Sun every minute. Those images can be found on the CESAR web site and can be used directly with the interactive on-line learning software prepared by the CESAR team. The refurbished 15m VIL-1 satellite tracking antenna at ESAC which was part of ESA's ESTRACK network and is now property of INTA, serves as radio telescope for university students. At present, after several research and development activities, it has been proven that several radio sources can be detected, measured and studied to show different radio emission mechanisms and its relation with different astronomical phenomena. Two optical telescopes with diameters of 50 and 30 cm are being deployed at the ESA Deep Space Communication Station in Cebreros, Spain and the NASA Madrid Deep Space Communication Complex in the Robledo de Chavela, Spain. They can be operated remotely from the CESAR control centre located at ESAC. The CESAR team is currently preparing an interface to provide web-access control to students from schools and universities through the Internet, so that they can carry out their scientific projects remotely. Since October 2015 the CESAR team is running a pilot initiative called "Space Science Experience" which consists of inviting classes from schools of the Madrid area to work on "science cases" together with astrophysicists at ESAC. While currently an essential part of the work has still to be done by the students during their visit to ESAC, it is planned for the future to carry out the hands-on activities completely remotely accompanied by several video conferencing sessions.